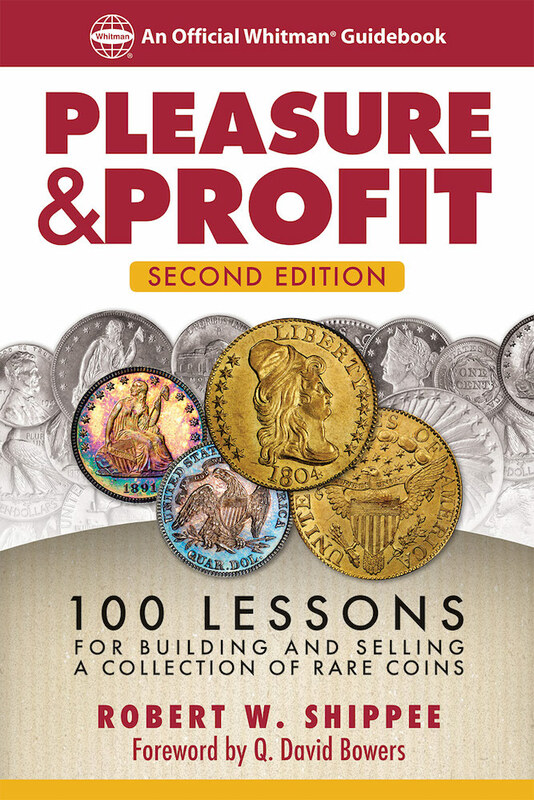 Robert W. Shippee’s book Pleasure and Profit: 100 Lessons for Building and Selling a Collection of Rare Coins was unique in numismatic publishing when it debuted in November 2014. Now in its second edition, it remains unique today—an insightful guide to building a coin collection, intelligently. What makes Pleasure and Profit so unusual? Shippee tells his story “warts and all,” publicly sharing not only his very profitable purchases, but also the expensive mistakes, with valuable lessons learned from each. His tale is crowned by a successful $1.5 million auction. Collectors new and old loved the first edition. Pleasure and Profit quickly became one of the most discussed books on collecting and investing in Whitman Publishing’s numismatic lineup. Shippee was invited to build an educational course around it. He and Kenneth Bressett (longtime editor of the Guide Book of United States Coins) taught the class at the American Numismatic Association’s 2015 Summer Seminar. Another indicator of a book’s popularity is how frequently it gets mentioned in related conversations. I’ve been happy to read so many positive comments and unsolicited recommendations in the hobby press, in book reviews, and in online bulletin boards. In the new second edition, which debuted at the February 2019 Whitman Coin & Collectibles Baltimore Expo, Bob Shippee updates his market reports on most of the coins in his case-study collection. He expands his discussion of rare-coin indexes, and his comparison of coins vs. the stock market. And he makes a new analysis of his collection by denomination, tracking where his coins would be, value-wise, a decade-plus after their 2007 sale. Shippee talks about acquisition strategies, storage choices, disposition options. This is real-world advice. He shares personal insight on grading services, auction houses, famous dealers, numismatic personalities, market forces, and—with candor that’s rare these days—his laid-bare financial results. His insight is humorous, wise, and unflinching. With the rare-coin market in a state of constant change, Pleasure and Profit remains uniquely valuable for today’s collector and investor.